Year two was fantastic. With the help of the Town of St. George, Blueberry Cove Camp, St. George School, and so many amazing St. George Community Members we pulled it off again and the second annual St. George Community Thanksgiving Meal was a huge success. Over 90 community members came to the table to enjoy a meal with neighbors. We only had turkey left, which all went to the Community Cupboard and most was taken home with pantry visitors on Wednesday. All of the helping hands, the delicious donations, and the giant hearts in our community brought together our neighbors to sit and share holiday cheer over a warm meal. The feedback we received was beyond positive. The room was full of smiles and conversations. Ultimately, that is what it is all about. Connecting with our neighbors. Being good neighbors. Additional thanks to the Town of St. George and Fire and Ambulance Service for use of the meeting room and facilities, to Blueberry Cove Camp’s Ryan LaShane for use of their commercial kitchen and serving accessories, Neighbor to Neighbor for offering to provide rides and deliver meals, to Janet Harjula and St. George School for use of their warming oven and the students who had planned to help with vegetable peeling again this year but were thwarted by the snow. It was an amazing display of our communty coming together with food, time and good cheer to make the second Community Thanksgiving Meal a success. This event was 100% community powered and the community donations reminded many of our neighbors that our small town is one that cares, one that hopes and one that comes together to make great things happen. Also a huge thank you to our Thanksgiving Community Meal Committee who make this meal happen with planning and collaboration: Linda Small, Sandra Hall, Dale Pierson, Autumn Belajonas and Stephanie Simmons. You all rock! In November of 2017, a small band of community members including Linda Small, Sandra Hall, Dale Pierson, Meredith Ballinger, Autumn Belajonas and Stephanie Simmons, came together to plan our First Annual Thanksgiving Meal. After weeks of planning and organizing the event was a success and we learned a lot about how to make it better the next year. This is definitely a community-powered event and we can’t pull it off without help from all of you! There is an online sign-up for donations and volunteer opportunities or call 207-372-2193 to talk to Alane and find out how you can help. A huge Thank You to all the volunteers and donors who helped to make the First Annual Thanksgiving Community Meal a great success. Community members cooked turkeys, peeled vegetables, mashed potatoes and shared their time to provide a warm meal with holiday cheer for neighbors and friends. 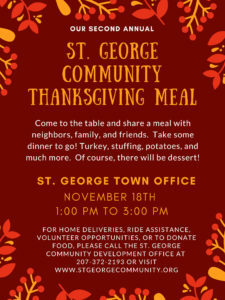 All of the food was distributed to St. George families either at the table on Wednesday, November 22 or by delivery to their homes on Thanksgiving day. The volunteers and donors were amazing and ranged in age from 5 to 83. We’d like to extend additional thanks to the local organizations that came together to make this event a success: Neighbor to Neighbor for offering to provide rides and deliver meals; Blueberry Cove for the use of their pots and pans and cold storage; the St. George Town Office for the use of their kitchen to carve turkeys; the St. George Fire Department for the chairs and tables; the St. George Business Alliance Members for turkey and dessert donations; the students and staff at St. George School for peeling and preparing vegetables, Ms. Smith’s second grade class for the pies; St George School for allowing the use of their gym and kitchen; and Herring Gut Learning Center for the delicious vegetables. This event was truly community-powered and we can’t wait to do it all again next year. Have thoughts to share on this community event? 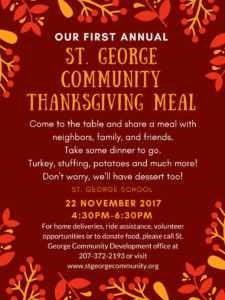 Send an email to info@stgeorgecommunity.org or give the St. George Community Development Corporation a call at 207-372-2193. Better yet, stop by our office at 47 Main Street, Tenants Harbor. Happy Holidays! What a whirlwind event! But, thanks to you, we pulled it off and the first annual St. George Community Thanksgiving Meal was a success. Here are some numbers and facts that should make you smile: Over 66 meals were served to St. George residents. Over 25 meals were taken home to feed St. George residents. That’s almost 100 full bellies in our town! We didn’t stop there. All of the leftover food was packaged with the original intention to deliver to AIO food pantry. However, through coordinated efforts, we found five St. George families who could use the food to fill their Thanksgiving tables. This means all of your helping hands, your delicious donations and your giant hearts helped your neighbors and community members, right here on our tiny peninsula, feel warm and full for Thanksgiving this year. Give each other a big smile and cheer! Thank you, again, for coming together with food, time and good cheer to make the first annual Community Thanksgiving Meal a success. This event was 100% community powered and your donations reminded many in our community that our small town is one that cares, one that hopes and one that comes together to make great things happen.